Internet of things (IoT) is a phrase which is commonly used to describe a system where physical world is connected to Internet through ubiquitous sensors that communicate with each other without human interaction. Each sensor and control point generates data which can be collected, analyzed and acted-on in the real time. IoT has the potential to alter the way companies do their business by transforming the way they operate, making them more efficient and profitable. The sheer breadth of IoT knows no bounds, and is having a huge impact in enterprise, as well as consumer applications, transforming the way we live our lives. A practical example of Enterprise application is the inventory management on the production floor to save money, time and manpower. And few examples of consumer applications are health monitoring systems, home automation, beacons, wearable devices etc. 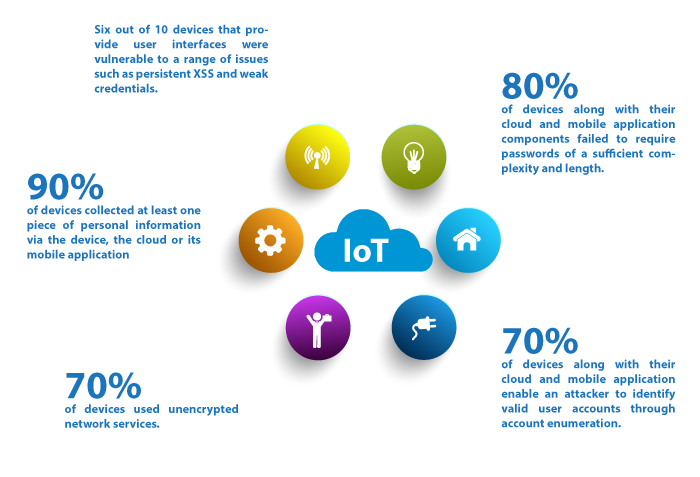 The penetration for smart devices is sky-rocketing, creating a perfect base for exponential growth for the IoT. It is estimated that by 2020, there will be almost 26 billion interconnected devices (some even say it could be more than 100 billion). As per latest statistics, IoT offer $8 trillion worth of economic opportunity. According to CBInsight, IoT companies attracted over $1billion in 2013 in venture capital, which is 11% increase from the previous year. Purchase of Nest Labs by Google and Body Media by Jawbone has further accelerated the IoT buzz. However, it is not just hype, and the connections are already soaring, growing at the rate of 19% compounded annual growth for the past three years. Some of the key technologies that are emerging for IOT are lightweight protocols so that devices can communicate and work together, cybersecurity, extensible and unique identifiers for billions for devices that involve remote sensing, intelligent monitoring, advanced analytics and real-time data processing. With the ease of connectivity through broadband internet, more and more devices with in built sensors, Bluetooth, IR and Wi-Fi capabilities are able to connect with each other with lower connecting cost. So what is the practical aspect of IoT, why we should bother about so many connected devices talking with each other? On the personal level, imagine a world where your car, house keys, television, alarm clock, microwave etc. are all interconnected, giving notifications and feedback when required, executing remote instructions, and improving the overall efficiency of your life. 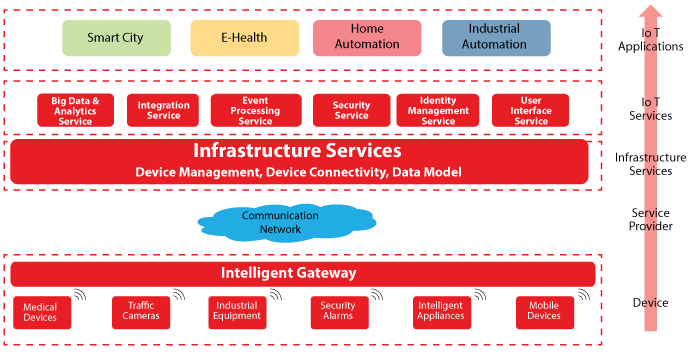 IoT can be associated with kitchen and home appliances, safety and security monitoring devices, lighting and heating products, health and fitness products, waste management systems, intelligent traffic management system and so on. Doctors can immediately analyze the heartbeat data sent from the intelligent devices to diagnose and treat. Real-time traffic data can be sent to the consumer’s GPS. Intelligent devices can quickly make changes in the production system based on the preferences of the consumers, producing a broader mix of differentiated products all across the globe and just in time. From the global perspective, IoT can help us understand how we work and live, and improve the processes, and reduce waste. There are currently more than a billion Machine-to-Machine (M2M) devices at work in smart meters, sensors, mobile healthcare assets, industrial control systems, smart building, video surveillance, telematics solutions and much more. These are definitely a lot of connections, creating a massive IoT network between people-people, things-things and people-things. Several open standard projects are supported by free open source software and hence this combination works quite well. Giant technologies can further build on the open projects, encouraging widespread use and adaptation. IoT has potential to impact the way we live our lives, however it has lots of complexities and challenges associated with it. Security is one of the most talked about concerns of IoT, mainly due to billions of connected devices. Another important concern could be the massive amount of data that will be produced. Companies will have to find a way to store, analyze, track and interpret vast amounts of data in real time. Some other challenges are connectivity, security, power management, complexity, rapid evaluation without common standards, quality of services, lack of shared infrastructure among players in the IoT eco systems, fragmented M2M and system vendor landscape, and interoperability and easy of deployment. Extensive number of systems are required to manage all the data, enforce access control and enable all the interconnected devices to communicate with each other. This issue can be addressed by using big data analytics which is a process of collecting, organizing and analyzing large amount of data to extract useful information, get fresh insight into data, analyze patterns and identify data which is important in business decision making. Existing Internet and software methods are modular, highly distributed and loosely coupled. For Internet of Things, we need an open system which is easy to join and transparent to review, open source for quick iterations and easy contributions for rapid development, and stringent IPR rules, neutral government and balanced participation. IoT offers endless connections and opportunities to take places, however, as of today, it is not possible to comprehend and understand its total impact. There must also be a strong foundation to address the growth challenges in terms of talent gaps, open standards, technology complexities and data policies. When evaluating an IoT solution, the businesses needs to consider four major enabling technologies- Cloud computing, wireless connectivity, Big Data and IT security. For now, we can just educate ourselves, and find innovative ways to reduce loss, waste and cost with the help of IoT.